New offerings feature unique tonewoods, custom colors and finishes and anniversary models. Martin has announced a slew of Special and Limited Edition models to be unveiled at the 2019 Winter NAMM show. Among the guitars are the GPCX1AE 20th Anniversary, celebrating two decades of Martin’s X Series; the Sailor Jerry artwork-adorned D Homeward and D True Love; and the DXMAE 30th Anniversary, celebrating Martin’s Navojoa, Sonora, Mexico, manufacturing plant’s three decades of operation. The full lineup of models is below. In 1999, Martin broke into the world of alternative materials and created a whole new class of high-quality guitars: the X Series. The year 2019 represents a milestone in the history of Martin’s Navojoa, Sonora, Mexico, manufacturing plant—30 years of operation. The model also includes Macassar HPL back and sides, laminated birch neck, and a Richlite fingerboard and bridge. Martin celebrates famed American-style tattoo pioneer Norman “Sailor Jerry” Collins in this special edition Dreadnought guitar. It features elements of Collins’s work, titled “Homeward Bound,” inlaid with seashell and hand-selected wood species on the headplate, fingerboard, and body. In addition to the custom artwork, this guitar features flamed koa back and sides with quilted bubinga binding and a custom inlaid koa headplate. 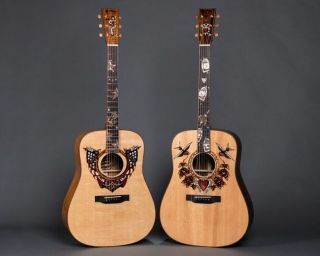 This special edition Dreadnought guitar features elements of Norman “Sailor Jerry” Collins’s work, titled “True Love,” inlaid with seashell and hand-selected wood species on the headplate, fingerboard, and body. In addition to the custom artwork, this guitar features figured East Indian rosewood back and sides with flamed koa binding and a custom inlaid East Indian rosewood headplate. This special edition Auditorium-style guitar features an Adirondack spruce top with a multi-striped, abalone pearl rosette and quilted sapele back and sides with European flamed maple binding around the body and fingerboard. It is adorned with ultra-modern appointments, including a carbon fiber pickguard, carbon fibre and titanium open-gear tuners, and red dot Liquidmetal bridge pins. This 00 14-fret slope-shoulder acoustic guitar exhibits a curly mango top with a gloss mango sunset burst finish, paired with highly figured curly mango back and sides. Other features include antique white binding and heelcap with multi-stripe border, a compensated bone saddle, Liquidmetal bridge pins on an ebony bridge, and an ebony fingerboard with Style 42 snowflake inlay. This limited edition custom 42-style Dreadnought features a Carpathian spruce top with aging toner, East Indian rosewood back and sides, and European flamed maple binding with multi-stripe border around the body, fingerboard, and headplate. The OMCE Shadow was inspired by Martin co-workers who were enamored of some dramatic finishes found in the solid body electric guitar world. This Orchestra-style model is the successful result of experimentation with various finishing techniques. It features a Sitka spruce top and quilted maple back and sides with silver binding and a unique translucent black sunburst finish. The OMCE Blaze was inspired by Martin coworkers who were enamored of some dramatic finishes found in the solid body electric guitar world. Other new models include a D-45 Excalibur, a collaboration with inlay artist Harvey Leach that features a custom inlay of a dragon intertwined around both a custom rosette and a custom back purfling, and a Size 1 De Goni Authentic 1843 that celebrates the very first Size 1 model and the earliest X-braced guitar ever documented. For more information, head over to Martin Guitar.